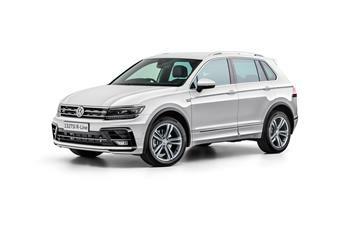 Volkswagen has added a new variant to its award-winning Tiguan range, its most affordable R-Line SUV to date. Also standard is the usually optional Driver Assistance Package, with Adaptive Cruise Control, Side Assist, Rear Traffic Alert, Traffic Jam Assist and Emergency Assist. The only options are an electric glass sunroof and metallic or pearl effect paint. The standard hue is Pure White with the choices of Tungsten Silver Metallic, Indium Grey Metallic or Deep Black Pearl Effect Paint. One thousand Tiguan 132TSI R-Line Editions are being built. Despite the continued lack of a sub-$40k Tiguan variant due to WLTP delays (the 110TSI version of both the Tiguan and the Tiguan Allspace re-enter showrooms late this year) the Tiguan family last month sold almost 1300 units. Volkswagen Director of Customer Experience and Marketing Jason Bradshaw said that the R-Line option has not previously been available on the 132TSI. "The single best selling variant of the Tiguan, either in five seat or seven seat Allspace guise, remains the top-specification 162TSI," Mr Bradshaw said. "Some 80 per cent of 162 TSI customers choose the optional R-Line package. "Customers told us that they wanted this option for the 132TSI. We listened. Here it is."